The Big Opportunity: Au Revoir Australie – Bonjour Paris ! Au Revoir Australie – Bonjour Paris ! For the next six weeks of my life, I will be working, studying and living in the city of love – Paris, France. I am incredibly grateful to have received this extraordinary opportunity while simultaneously petrified of the unknown. What will working in a French organisation be like? How will the strong, vertical hierarchy compare to an Australian workplace? Will anyone understand me over my thick Aussie accent!? All of these thoughts circle around my mind, but it’s too late to turn back now – I’m on the plane to Paris! So let me explain a little, about two months ago, I was lucky enough to be accepted into the Paris Industry Placement Program – a University of Sydney Business School initiative established to enrich the student experience through an immersive international program. 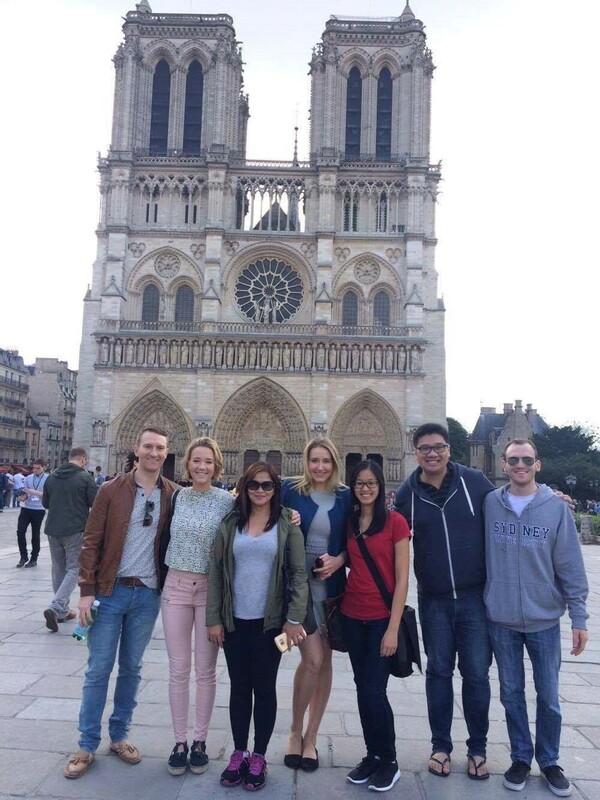 The IPP takes place over the Australian winter for six weeks, and all students will be working in a French or multi-national organisation whilst also attending one of France’s preeminent universities, Sciences Po. As a commerce student, I was drawn to the IPP due to the practical insights in international business that I would be able to attain, as well as the personal development that would inevitably result due to the fact I would be working in a completely foreign country (and so out of my comfort zone!). As an international business major, the opportunity to be exposed to an entirely different culture would be an invaluable experience for my cross-cultural understanding and ultimately enhance my profile for future employment in an industry specific position. Reading “I am delighted to advise…” while standing in line for a coffee at the ABS cafe was one of the most electrifying moments of my life – but getting to that point wasn’t without its hurdles. Written applications, online interviews and competitive assessment centers – that is all ahead of you if you wish to partake in a future IPP program. But don’t let them deter you, in fact, take it as an opportunity to practice for graduate programs as the process is very similar to that conducted by the IPP. The written component of the application is pretty straight-forward, but some advice for when you’re sending in your resume: tailor your resume to your dream position. For example; if you would like to work in consulting, ensure you emphasize your desire to attain such a position, same goes for finance students wanting to work in risk, or marketing consultants who wish to work in fashion. By articulating your ambitions, you are more likely to be matched with a suitable organization. Advice for the online interviews – be yourself. I remember I was feeling shaky and nervous for the online interview, having never replied to a computer when asked to speak about my career aspirations before. But you can imagine how many interviews the assessors have to watch, so by injecting some personality into your answers, you’re more likely to stand out from the crowd. Oh and study up on some interesting aspects of Paris (or whichever country you will be applying for) as it really shows you have a genuine interest in your country of choice. The assessment centers are intimidating, no doubt, but realise that everyone is in the exact same boat. Try to develop rapport early with your peers as it helps ease the nerves and helps when you’re developing answers to case studies in a team environment. Also, be mindful and open to everyone’s ideas, and always remain positive and constructive, you want to show how adaptable you are in diverse environments. Focusing on your strong suits and let others show off theirs, in the end you’re working as a team so make sure you help each other. One of my favorite quotes and one that I believe will be particularly valuable on the journey ahead. No doubt I will encounter tasks that challenge me, I will be exhausted from work, class and the language barrier, but regardless, challenges shape us into better individuals. So this is the mindset that I will take with me, no matter how difficult the road may get, I will remain positive and work hard. If you’re reading this and you would like to apply, definitely take a similar approach, no doubt it would only push you further. Remember, if it doesn’t scare you, it’s not big enough! By Anna Bezuglova, current student at the University of Sydney Business School and participant in the Industry Placement Program in Paris.